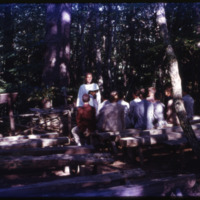 This image shows a group of boys dressed in blazers sitting on rustic benches in an outdoor chapel. A priest stands before them holding an open book and smiling with the sun on his face. 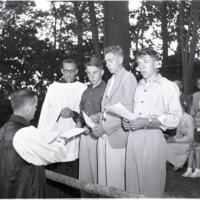 This image is of an Episcopalian priest handing three young men papers during an outside church service. The original envelope was labeled "Holy Cross Episcopal church services, 8-30-53, christening" and had been filed under "Churches." 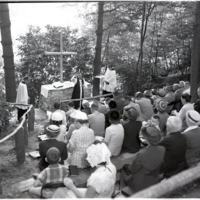 This image is of an Episcopalian church service being performed outside by a priest to a seated congregation. The original envelope was labeled "Holy Cross Episcopal church services, 8-30-53, christening" and had been filed under "Churches."